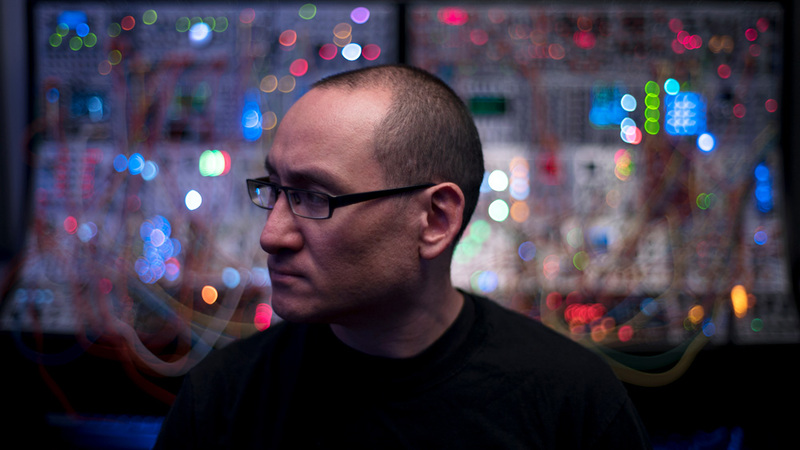 On November 2, Richard Devine is releasing Sort/Lave, an album six years in the making. 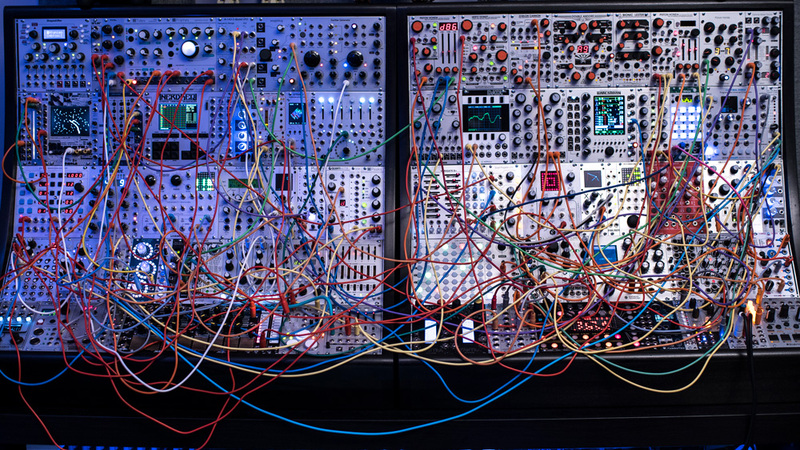 The electronic music veteran and sound designer—who has crafted sounds for everyone from Propellerhead to Google—took a fresh approach to Sort/Lave, abandoning his extensive instrument and virtual instrument collection to make music almost entirely with his Eurorack system. Having lucked upon an ARP 2600 and other discarded analog synths in pawn shops while still in high school, befriending a synth tech that showed him the ropes, and jamming with Tony Rolando long before he founded Make Noise, Devine has had a long history of experience with modular formats—and had a front row seat for the explosion of Eurorack. "I would say that my introduction to all this is slightly different than most people who are probably just getting into Eurorack as their first modular," Devine says. Yet, like any budding Eurorack synthist, he had to overcome frustrations and hurdles on his way from making patches to making music. 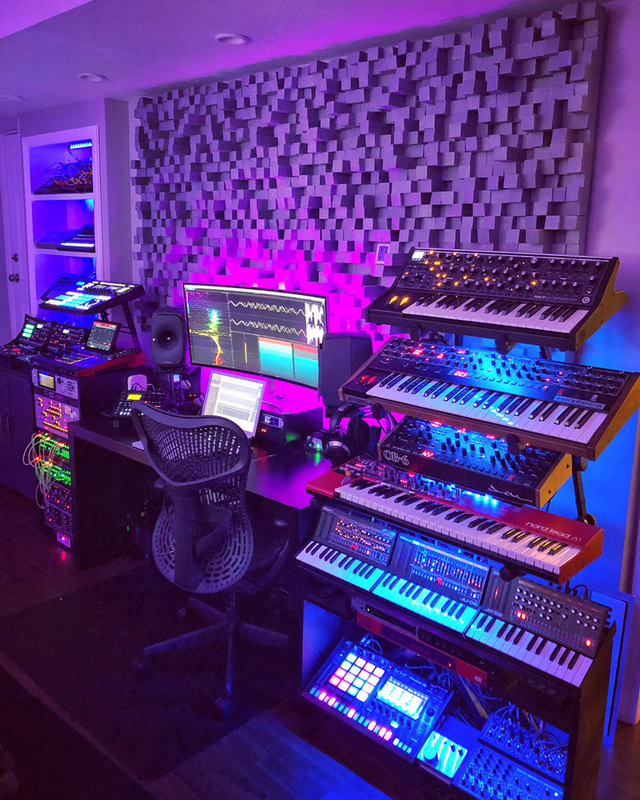 He devoted himself to learning the format in-and-out—posting videos of jams onto his popular YouTube channel, performing hundreds of freeform gigs, and, in 2016, setting out to record at least one patch every night. Sort/Lave is a collection culled and refined from these moments. We spoke to Devine to ask about his history with modular synths, what problems he ran into while making the switch from plugins to Eurorack modules, and what makes the format particularly exciting. To pre-order the album, visit Devine's bandcamp page. I read the statement that you made when you announced the new record about your six-year journey with Eurorack. 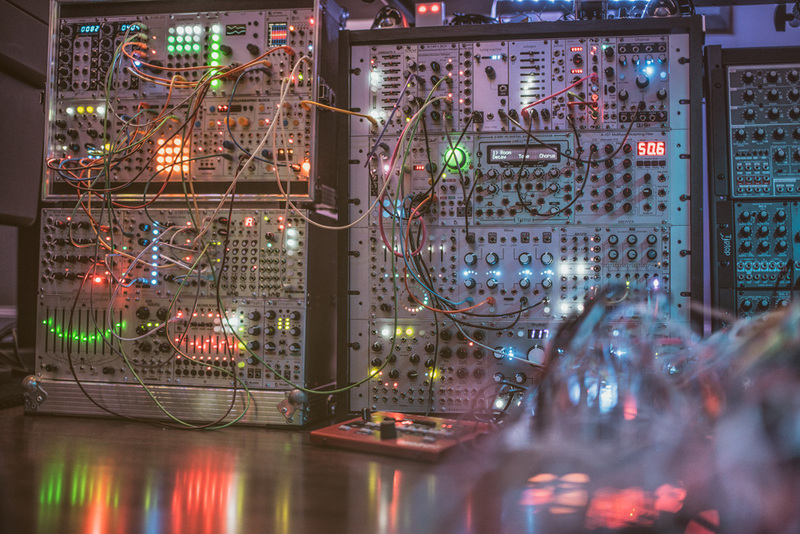 You've been using modular in some form or another since you were 17. Up until RISP [released in 2012], what was your familiarity with modular synths? What kinds of systems were you using? And how extensive was your rig before you started this recent journey? My first introduction to modular synthesizers was with the ARP 2600. I was 17 years old in high school when I first got it. It was my first real analog synthesizer, semi-modular synthesizer, as well, because you could use it both ways. You could use it as a fixed base synthesizer that had options that you could tweak using the sliders, or you could use the patch points that are on the front. So, you really had two ways of approaching using the synth. It was just great in that it taught me a lot of the basic fundamentals of sound-shaping. What does the voltage-controlled oscillator do? What does a voltage-controlled filter do, what's ADSR—these really sort of simple concepts in the beginning that I didn't really have any clue what they were. It was my education in basic sound synthesis. And the fact that it had speakers built in meant you didn't really have to plug it into anything. You just plug it into the wall and kind of go and explore things. I used to plug it up in my parent's garage all the time because they had really high ceilings at their house and the reverb in their garage was just amazing. You could get the thing to play so loud, and it would just create these sort of really alien soundscapes that would reverberate through this large space. From that point, I started to buy other modular-based synthesizers. Another synth I got shortly after that was the EML-101 Electrocomp. I had bought that from—I think it was the University of Connecticut, some guy that worked there at the university. This was in the early '90s when a lot of these studios and universities were trying to get rid of all this old stuff. They didn't even want these old modular synths around, and I was in the exact opposite end of the spectrum. I was hitting the pawn shops every weekend here in Atlanta. That's how I got my ARP. I got it at a pawn shop, used. The guy had no idea what it was and I think I got it for around $250. And it was a little beat up. I had a tech work on it and get it fixed up. I actually still have that ARP that I bought when I was 17. It's still here in my studio, and I still use it, even today. I went and bought the EML 101. I bought an EMS Synthi, which was also another portable modular synthesizer that I had for about six or seven years. I recorded a lot of my early releases with it. And then I also have a couple of systems that were custom built by a friend of mine named Tim Adams who was an ex Sequential/Oberheim tech here in Atlanta. There was a repair place here in Atlanta where a lot of music studios would take a lot of their vintage synthesizers to get repaired. There's a pretty big market down here for R&B and hip-hop artists. And there was a shop that was run by a friend of mine named Richard Goodsell that would sort of work on Hammond B3 organs, and then they would do other projects—like old Sequential keyboards, Oberheim and Roland, and if you had any of these older keyboards, they would repair those. Their main tech was this guy named Tim who I had met basically just by hitting them up randomly, saying, "Hey, I've got a synth that needs some work that I bought at a pawn shop." I then got introduced to Tim, and we hit it off. We became friends right away, because I was really eager to learn more about analog synthesis, and he was helping me repair a lot of the stuff that I was buying. This is all around 17, 18 years old. So, I was kind of really, really diving into all this right around that time, and he was building some of his own synthesizers at the time. He built me a couple systems that I still have today. One was a modular system that was all based on banana jacks that was a three-oscillator, dual-filter, dual-envelope-generator system that was kind of based off the Moog System 35. But he kind of did his own twist with that design. He did something a little bit different, and it also had a 16-stage sequencer. I also have that system still here running that I use from time to time on projects. Unfortunately, he passed away in 2006, but I still use his stuff, even in this day. I owe a lot to Tim because I probably wouldn't even be here had it not been for him. He had a big influence on me, not only with teaching me about early circuitry of how analog synthesizers work and being able to do basic repairs on my own stuff, but also musically, too. I inherited a big part of his record collection when he moved out from his apartment to his house and his wife said, "Hey all these records have to go. We're about to have two kids." So, I got all these great records around that time and discovered a lot of music that I probably would have eventually discovered but not as early—not in high school. Artists like Morton Subotnick, John Cage, and Karlheinz Stockhausen—an eclectic collection of stuff—everything from Herbie Hancock to Kraftwerk in these four crates of records. I was basically just getting educated on all ends. Richard Devine - "Harmonic Symmetry"
So what is it about Eurorack that captured your attention now? I guess I was right there at the beginning, kind of, at the Eurorack revolution. Dieter Doepfer had already had his Doepfer stuff out—I want to say the first year that I started buying [Eurorack] stuff was probably around 2005. They were all Doepfer systems because at that time, it was just Dieter Doepfer stuff, Analogue Solutions, and I think Cwejman—Wowa Cwejman—had been making some modules. But they were designing stuff to work in their own systems, so Analogue Solutions had their own case with power that you would buy. It was still the same form factor, but they had a catalog of modules that you could buy from and basically build your own analog solution system. The voltages were slightly different than Dieter Doepfer's at the time. So you really had to buy either, go with their system or Dieter's or even Cwejman—they had their own case at the time that was using all their own power. It wasn't the sort of a unified format that we see today. I was really drawn to Dieter Doepfer's early designs. I remember looking at all the wide variety of different modules that he had and I was like, this is such a cool concept that you could basically just buy an empty case and then you design what you want. You know? You think about what the task is that you want to accomplish. Do you want this to be sort of like an effects processing box, or more of a sequencing station, or for this to be a purely new generative sound texture machine, or for creating just sound textures with groups of oscillators and filters and stuff? He had such a wide variety of different modules. I decided to take the jump with Dieter Doepfer's stuff and I built basically two G6 cases, which were, I think, 84 HP wide at the time. So, I bought those two cases and I built up and I went from there. I just dived right in. What I loved about it is I would just constantly unscrew the modules and move things around in different configurations, and I love that it was modular right down to the core. You know? Whereas all the other synths I had used were modular, but you couldn't really change the modules. They were still fixed systems that you could patch within the systems freely, but with Dieter Doepfer's setup, you could completely change the entire instrument itself and redesign and repurpose it for different applications or whatever you wanted to, which was, to me at that time, a radical idea. It was almost like Max/MSP or Reaktor, but in real life. You know? Like having a hardware version of that, but even having more fun because it was physically interactive and you could change things at any point. It was, to me, a really exciting time, and I remember shortly after that getting in contact with Mike Brown and Peter Grenader. They were in a company called EAR [Electro-Acoustic Research], which, later, they broke into two different companies. Mike split off and did Livewire Electronics, and then Peter decided to split off and do his own company called Plan B. At that point in time, they were one of the first two American Eurorack manufacturers to make a third-party module that would work within Dieter Doepfer's Eurorack format. Shortly after that, I met Tony Rolando who lives actually pretty close to me—he lives in Asheville, North Carolina. I met Tony when he was working at Moog. Make Noise wasn't even around when we first met. My friend Josh introduced me to him, and I think he was a tech on the Voyager line—like they would make the Moog Voyagers—and Tony was working as a tech fixing stuff on that. We would hang out with Tony on the weekends because he was the only other guy that we knew for miles down here that was into analog synthesizers. He also had a Doepfer system and was already sort of investigating and looking into this new format too. We were all kind of discovering and playing around with the stuff at the same time. We'd meet up on the weekends and drink whiskey and bring over our Doepfer systems and patch and hang out together at Tony's place. And Tony's like, you know what? I think I might get into building some of this stuff. I remember helping Tony just right at the beginning when he first made his modDemod, his passive ring mod, and then from there he made the Quad Multi-Mode Gate, sort of a low-pass filter. And then Maths. I was pretty much there every step of the way with Tony since the very beginning, from when he started Make Noise and it was just a very small thing right out of his house. It was interesting to see how all of this stuff sort of slowly started to gain popularity. At the beginning, no one really knew about this stuff. 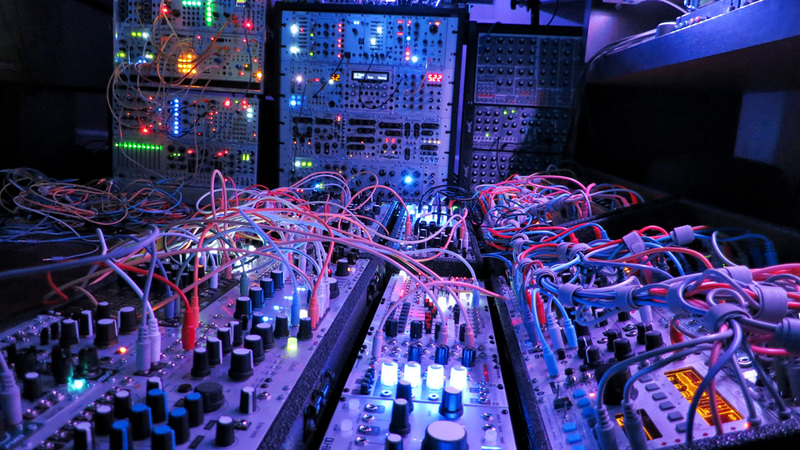 It was still sort of, I want to say, an underground thing within electronic music makers, like I always used to stop through LA to visit Analogue Haven to visit the shop and check out the new modules that they had. And back then, it was still pretty underground. A lot of people were just like, "Why are you messing around with this stuff? You could do it on a computer. It's easier." To that point, you've used music software to great effect throughout your career. So what's the principle appeal of using Eurorack modules instead? I felt it was just an extremely inspiring platform to create music and sounds with, coming from being a sound designer in my day job. I work on a computer pretty much all day with a mouse and looking in a screen. Working with these instruments is such a nice departure from that, because it frees you from working with a mouse, doing single point parameter manipulation on a screen, where you can just work with your hands and your ears doing dozens of sort of tweaks, knob turns, and button pushes. And you're not looking at a timeline based editor, like in a digital audio workstation, where I find myself falling into bad habits when I use a computer. I kind of get lazy and do the same things. Whereas with the modular, what's great about it is that you start fresh every time. In the beginning of 2016, I sort of said to myself, "Hey, you know what? After work, I'm going to set a goal that I'm going to record a new song every night. I'm going to patch up a new patch on my system every night and just see what happens." Some nights I would get utter crap. Other nights, something really spontaneous would happen and sometimes, really amazing things happen. I just pretty much would record every night and I still do that, even to this day. I spend a few hours patching every night and seeing if I can record a song—that's been kind of a goal for me. I've accumulated probably around 250 tracks or more over the period of two years. Sometimes I would go into it with some idea, thinking Hey, I'm going to do this, and then some spontaneous accident would happen along the way that would shift the whole course of what I was trying to accomplish, but it would be something way cooler than what I was trying to do in the beginning. It's been a really fun experience working with it and it's been a sort of creative springboard for so many things in my workflow as far as coming up with new sounds for sound design. Also, an amazing tool for creating music. I like generative, probability-based—I don't know how to describe it—modules that sort of can generate things for you. You kind of steer them in a way a little bit and then you kind of just let things go, let the system do its thing. You're kind of just controlling the parameters of this ongoing voltage architecture structure that you created. 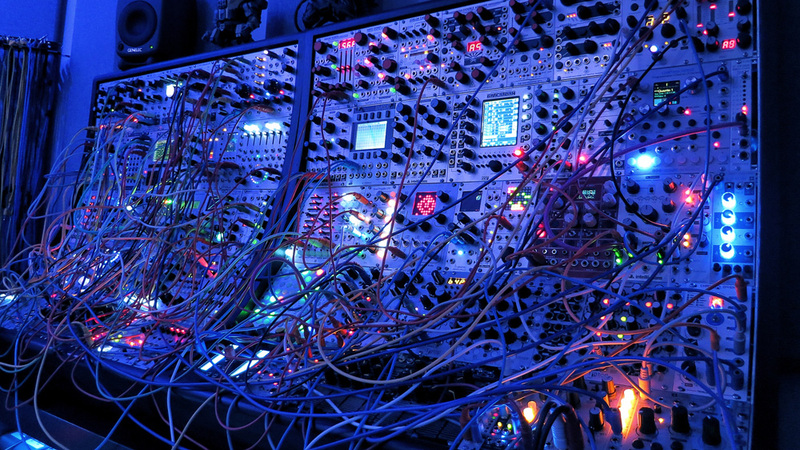 I'm wondering, when you were getting familiar with all these Eurorack modules, was there stuff that you were accustomed to being able to do with software? Did you find any one-to-one replacements between specific modules and specific plugins that you had kind of grown to love? When it comes to plugins, everyone knows I'm a huge plugin advocate. I love digital signal processing and using the latest stuff as well. There's definitely modules that are close to certain plugins that I have, but I feel that there's still different flavors of things. I think the closest emulation that I found to a plugin is Sean Costello's stuff, the Halls of Valhalla card for the [Tiptop Audio] ZDSP. I've always been a really huge fan of Sean's plugins. His reverbs are just absolutely fantastic. 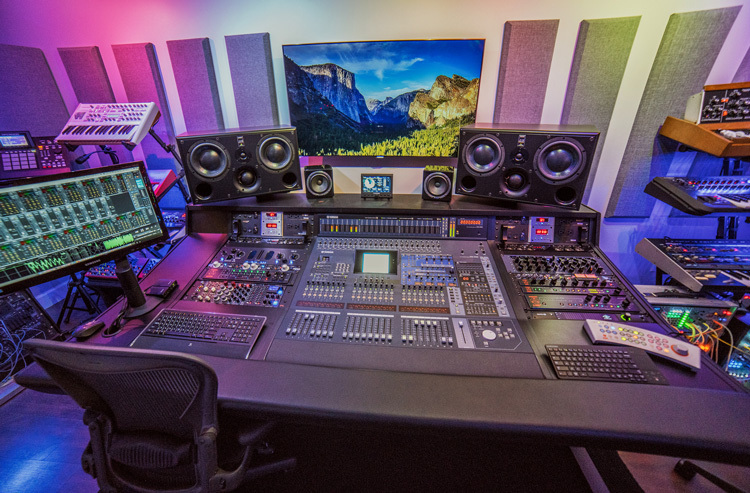 It was just like a dream come true when Gur [Milstein] at Tiptop, Chris Clepper, and all the guys at Tiptop were like, "Hey, why don't we work with Sean on taking Shimmer and all his great reverb algorithms and making a ZDSP card out of it. So, that was a great example of one of my favorite plugins making it into the Eurorack world where I get, now CV control over those parameters as opposed to automating it on a timeline in a sequencer. Now I can modulate it with any sort of envelope, generator, LFO or whatever complex waveform source to get all kinds of crazy stuff happening that would normally probably take longer to do in the computer and be much more fun, much more hands on with it. What were some of the specific stumbling blocks or hurdles that you faced when getting familiar with Eurorack modules? My first frustrations in the beginning [with early, pre-DSP modules] were the sequences were really basic and very simple step sequencers that could do just very simple things. You know? Play forwards or backwards. Play a set of predefined voltage settings or pitch settings. And then you would have to use a sequential stage module to switch the stage of row knobs that you wanted to play. So, it was fairly limited what you could do in the beginning. So, I definitely had some frustrations of things that I wanted to do that were much easier to do in the computer, but then seemed much more difficult to do with the modules that were available at the time back in the beginning when I was using this stuff. But also, that was also cool in that those limitations also forced me to come up with creative solutions to those problems. So, I would come up with cool things or abuse those modules and do things, like hook up one sequencer to another sequencer to get longer sequences or have one sequencer play into another sequencer to come up with different outcomes. It forced me to be more creative with what I was doing with the set of limitations that I had at that point. But now, a lot of those problems that I was experiencing in the beginning, those have all gone away. Now, we're at a period now where we have got some serious DSP power behind a lot of the newer Eurorack, the newer generation Eurorack modules where we could do really, really advanced things when it comes to sequencing, creating sort of generative rhythmic patterns, melodic patterns. You can now sequence stuff at any scale. Any timing resolution you want on a track-by-track basis. You can have stuff playing in multiplications, divisions in time—and you can rotate or flip those tracks. So things can get very organic and interesting and you can really do stuff now that would be very difficult to do in a computer, unless you were building patches in a computer like you were building maybe a synth or some system in Max/MSP or in Reaktor or Pure Data, or one of these environments that modular, where you're hooking up things with modules and building from scratch. Today, I feel like we're living in a really exciting time because there's so many interesting possibilities with this latest generation of modules, whether they're digital oscillators or these really advanced or multi-effects voltage-controlled modules. It's really, really cool to see all this new stuff coming out. At least for me it is. I've been able to do things now that I just never dreamed I was going to be able to do. Even looking back six years ago, I would have never guessed that we would be at this point in time. Like I said, there were definitely some frustrations in the beginning. Mainly, for me, sequencers were not doing some of the things that I wanted to. I wanted there to be more probability-based sequencing, where I could define how much of a note would play or not play. Like, there'd be a probability-based algorithm that decides what percentage of that note would be played, how long that note would be played. Would it be ratcheted? Could it be shifted in time? Could you offset that note or control voltage? Whether that's a gate or just a CV source? Now I have sequencers that can define all of those things and you can really, really, really pinpoint exactly how you want that event to behave in a sequence of a bigger picture of things. Can I ask, what are some of the specific sequencers that you love? Yeah. Most recently, I've been really digging the Eloquencer by Winter Modular, which has been really awesome. The Nerd Sequencer's another really fun one, the Hybrid Tracker sequencer, fun for sort of the old-school tracker approach to sequencing old drum break loops and stuff of that nature. Always been a big fan of Gur's Tiptop Circadian Rhythms. I would say it's more of a drum-based trigger sequencer. And actually, Winter Modular and Tip Top Audio have implemented what they call Devine mode. I had them actually add special modes into these modules that are available now on both the latest firmwares where they added in some features that I requested to make them more fun, I guess. I mean, they were already fun. They were already great. They're great companies. They're all good friends of mine. I was just like, "Hey, what if we add this?" It was just great having a close relationship with some of these companies that they were like, that's a cool idea. Let's do it. Let's implement that in. We'll give that feature to all of our users. And it was just from me playing so many shows, hundreds of shows with these systems out at festivals all over the world and kind of thinking like, how could I make this more fun? How could I interject more, some features into these sequencers that would make writing on the fly much more fun and coming up with generative sort of musical ideas that happen much faster? Spending less time programming stuff and more time jamming. I would say most recently, I just got into using Polyend. I think they're from Poland. And been a big fan of their stuff. I've been using the Polyend sequencer and their MIDI-to-CV converter. And then the Erica Synths Drum Sequencer. I think I use all of them [laughs]. But those are my favorites, for sure, most recently for drum sequencing. And I'm also big on randomization. I love the Make Noise Wogglebug, the Mutable Instruments Marbles, and sort of random, generative, voltage-controlled generators like that are really fun. I love driving sequencers and using those as my master clocks to a lot of my cases here at the studio and during live performances. Where most people probably use a pretty steady clock, I'll use a random generator, like a random voltage generator that generates clocks and random voltages as my main clock. When do you know that a patch that you were kind of running as an experiment becomes a piece of music? It comes down to I think an emotional feeling I get. If I get the patch to a certain point where I'm like, Wow. Something's happening where I feel like I'm witnessing or experiencing something that's out of the norm, out of the ordinary, at least for me. You know? There've been plenty of patches that didn't really move me. But then there's that moment where you lock into something. You kind of connect into this. You create this space, this feeling that you get just experiencing the patch happening. At least for me, that's when I know I'm onto something. 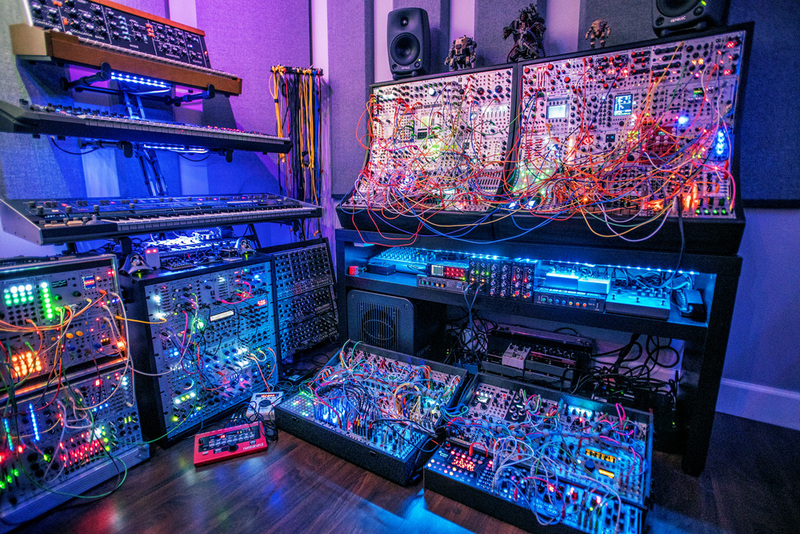 That's what's so cool about Eurorack stuff—it can go either way. It could be a failure or it could be exactly what you wanted. Sometimes it goes in a direction you didn't even think it would have went because something wrong happened along the way or it comes out even cooler than what you had envisioned in your head. And I can't say that happens with many other instruments that I have here at the studio. That's why I think I love working with Eurorack, is that one wrong turn can shift the whole thing in a completely awesome direction. It could also be in a tragic direction [laughs]. It could be disastrous, but I love that. I love how much risk there is involved. It's like you're right on the seat of losing it all at any second. So, you ride that fine line every time. And I don't know any other instrument in the world that gives you that sort of flexibility and also those feelings of like, once the patch is gone, that's it. You really have to capture this one moment in time. You have to really think about that concept of capturing this one moment that's never going to happen again. And somehow taking that photographic snapshot, audio snapshot of that point and letting people experience that. You can't play the patch ever the same way twice. It'll always play differently. To me, that's just such an interesting idea and concept for making music and even the concept of designing a music composition with that as your basis is just, for me, such an intriguing idea.